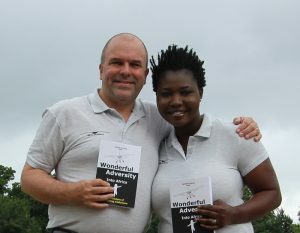 Wonderful Adversity is a series of books providing entertaining reading, seasoned with inspiration and motivation. The three primary volumes, Wonderful Adversity: Into Africa, Wonderful Adversity: Out of Africa and Wonderful Adversity: Clash of Cultures, are based on the authors own lives, retold in a readable manner that makes putting the book down a challenge. Furthermore, the authors are accomplished speakers offering key-note, theme-setting and other speaking engagements. The writing style is aimed at being readable, informative and fun, suitable for all readers over the age of 16 years. If you like a good adventure, flying, engineering, stories of personal survival or just want to read about what real-life adventures might really entail, these books are for you. The tabs above will give you some more insight to Wonderful Adversity, and we hope that will be in touch with our team via our contact page.